I've been dying to tell you about our White Water Rafting Adventure but I had to wait patiently for the Rafting Co. to post the professional pictures for your viewing pleasure...I'm a nice little blogger, always looking out for ya'll! 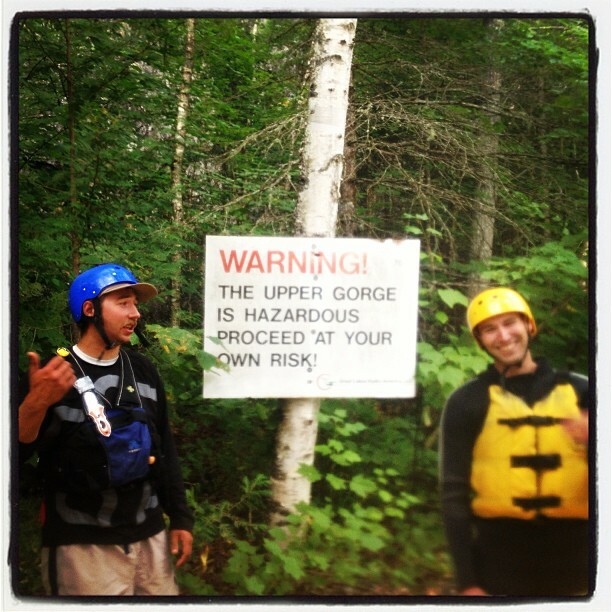 So, Justin had never been white water rafting and apparently the Upper Penobscot River has some of the best rafting on the East Coast. 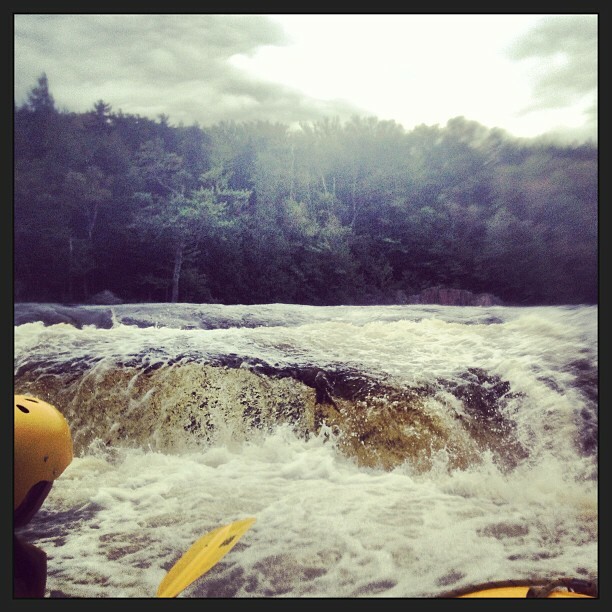 We're talking Class V (and with enough rain, class VI) rapids right around the corner from our house. I have been rafting in West Virginia and Coasta Rica and a few other places but rarely (if ever) have I rafted a true Class V rapid...and the trip I found for us happened to boast two Class V's! After a quick Google search, I decided to book our trip through Northern Outdoors....mostly because they have a great website, have amazing opportunities for winter sports and had availability for a Penobscot trip on super short notice. 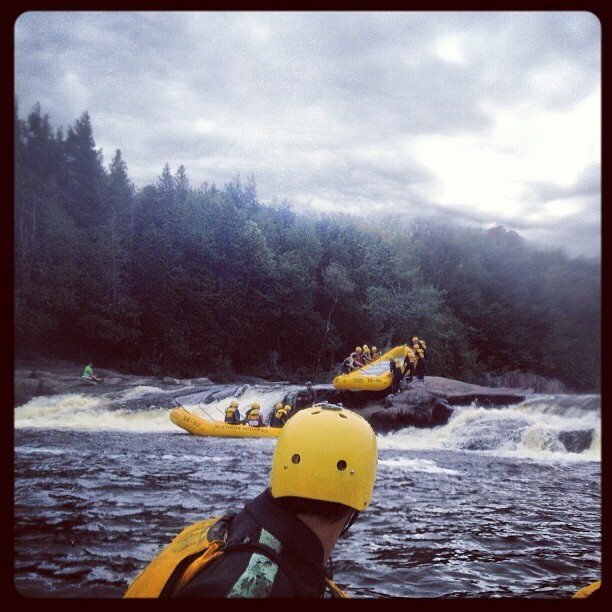 An added benefit to our trip being on the Penobscot was that we would be rafting around the base of Mt. 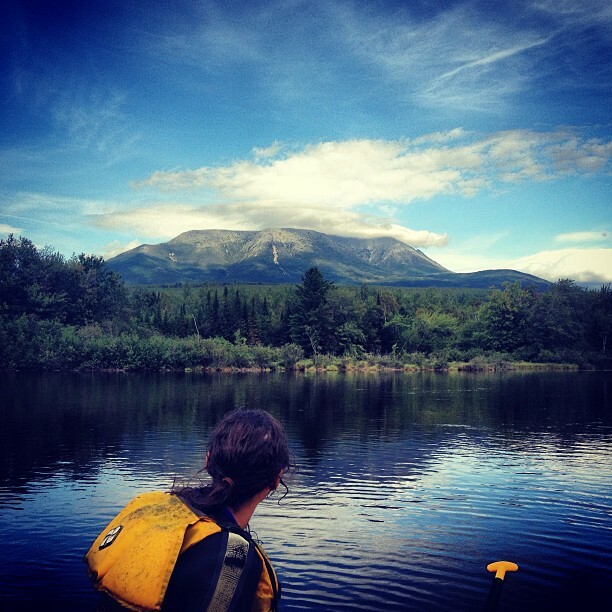 Kahtahdin, the tallest peak in Maine, and Justin loves a mountain landscape. (note: there is a camp ground and cabin rentals all around the meeting point - most people camped the night before and rolled out of their tent or rental and right into check in...we chose to make a day trip out of it). So, Friday night we were off to bed at like 7pm to ensure we had the stamina to make it through our early morning and adventurous day. We were up before the sun and hit the road to head an hour and a half north to the outpost for Northern Outdoors. The rafting center is just before the entrance of Baxter State Park, so basically, in the wilderness (no cell service, GPS or human beings, just moose and wet rafting gear). A couple of different outdoor companies use the Penobscot Outdoor Center as their hub for outdoor activities - which means, as far as outdoor centers go, that it is awesome. It has a bar complete with it's own brewery on site, a kitchen turning out breakfast goodies and coffee and a massive fire place (which we needed at 7am). Upon our arrival, the first thing we noticed were the rows and rows of wetsuits. I had read online that our rafting company required wetsuits before April and after September 30th and Justin and I had debated on whether or not we would opt into a seal suit. I didn't want to be the weak Southerners who couldn't stand the Maine elements so I was wearing 17 layers of clothes and was going sans wetsuit if it killed me. Luckily, when we arrived the staff prepped our our group that because of the day's weather - mid 60's and overcast- they were strongly encouraging everyone to suit up. And trust me, everyone did but 2 strong, beefy guys who looked like they could take a punch from the Penobby. I feel the need to let ya'll in on a little secret: Wet Suits are not your friend, visually. Especially if you are already wearing multiple layers underneath. I had this weird ring of fabric right in the worst possible spot (fupa) from my 4 pairs of pants and that baby was not easily missed, thanks to my wet suit. Ok, moving on. We got a safety briefing and hopped on a bus headed up the Golden Road (home to the TV Show American Loggers) to our load in spot. Mt. Kahtahdin, we're coming for you! In my limited experience, the fun factor in White Water Rafting really is luck of the draw - your raft mates and guide will definitely set the tone for your day. We were lucky and got paired with a rowdy, rag tag group of Bad News Bears. No kids on board, no grandparents and certainly no one offended by a cuss word or dirty joke. Many, many thanks to Jessica K. who was in our raft and had the coolest water proof cover for her iPhone - all of the rafting picks below are courtesy of her. And I will own one of those covers next time, promise! Our guide was Derik and there isn't much I can say about him without jeopardizing his job as a river guide...but he was a blast and we all made it out alive. And because I know you're wondering: no, the water really wasn't that cold. I actually thought the water in West Virginia was colder. Me and Grace - probably right after I correctly identified an adolescent Bald Eagle from a mile down river and Grace's heart exploded with nature happiness. Also, paging a plastic surgeon, I need chin lipo ASAP. I will say that at one point (after our lunch cooked river side) we headed off the main river to a stream that boasted a natural water slide....that water was the coldest I've ever been in (including salmon fishing in an Alaskan stream). It came directly from the mountain and it.was.freezing. Fun, but freezing. Below: Justin watching the other rafts in our trip drag their boats up a well known rapid so they can raft the fun part again....the boat that is climbing up in this pic will completely eat it on the way down the rapid approximately 2 mins after this. Like, 4 people washed out at once. It was awesome. Getting ready to surf, Mainiac style. I'm easy to spot, my helmet is a completely different shade of yellow than everyone else's - and Justin is sitting right in front of me and my dorky helmet. Ya''ll are welcome for my facial expressions! I clearly had a blast - the second to last pic is my personal best, I think. And honestly, I should purchase the last pic as a memento because everyone really is so victorious and proud...perfectly sums up our boat crowd and our day. 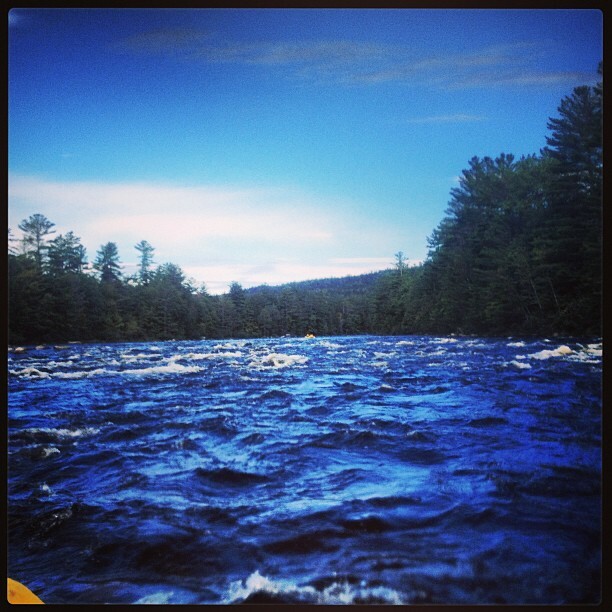 If you are looking to raft in the area, I highly recommend Northern Outdoors. We had a blast, were perfectly safe, well fed and cared for, appreciated the facilities and beer at the end of the day and thought the pricing was reasonable. I actually look forward to taking my parents on some sort of Winter Adventure when they come to visit in December - I'm thinking a cabin in the woods and snowmobiling! So, who else wants to come visit for some Mainiac fun?! If you’re planning on going whitewater rafting, it’s a good idea to know what kind of water you’re going to be navigating. Whether you’re an expert or beginner, you want to choose the level of action that suits your skill level and thrill tolerance. What a fun trip!! Your pictures are amazing, its so beautiful up there! 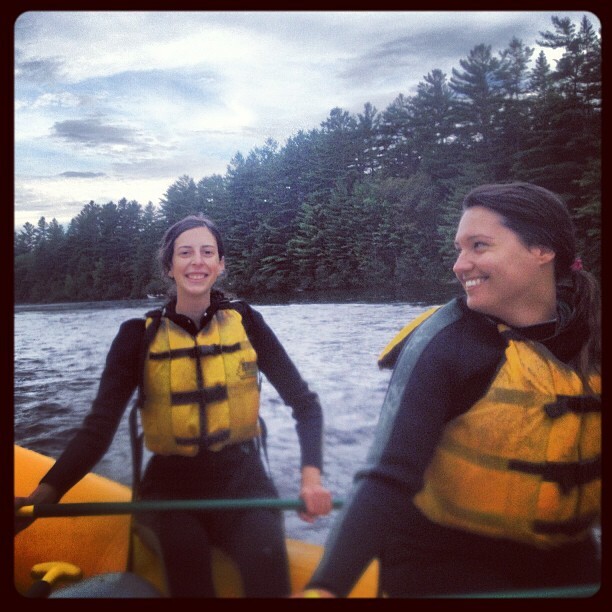 I've only rafted on a Class III but flipping out of the boat was actually fun and made me less nervous after that! 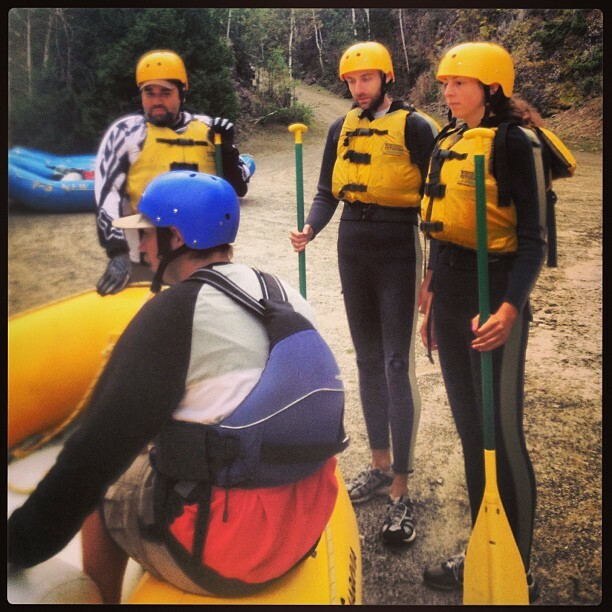 I actually really really want to go white water rafting. I've never been, and I'm not very outdoorsy, but for some reason this has always been on my list. Looks like a blast! 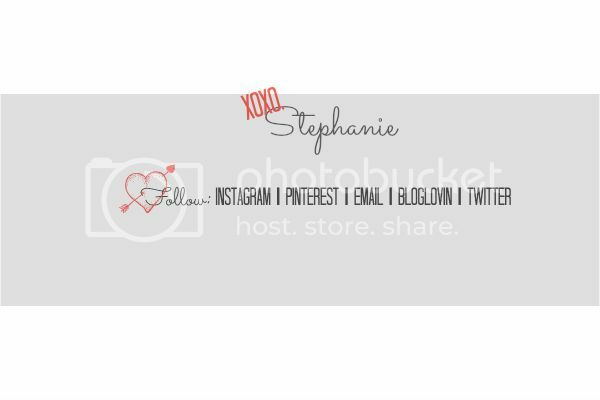 The pictures are awesome!! Looks like a great time! I've never been but thinking about trying the man made one in Charlotte first before I go big! This looks like so much fun. I'm glad that y'all enjoyed it and thank you for sharing the BEAUTIFUL pictures!